Description: [pro-SHOO-toh dee-PAHR-mah] Cured, Boneless Parma Ham made according to the age-old tradition of salting and aging the hind legs of pigs, transforming them into a true Italian delicacy. 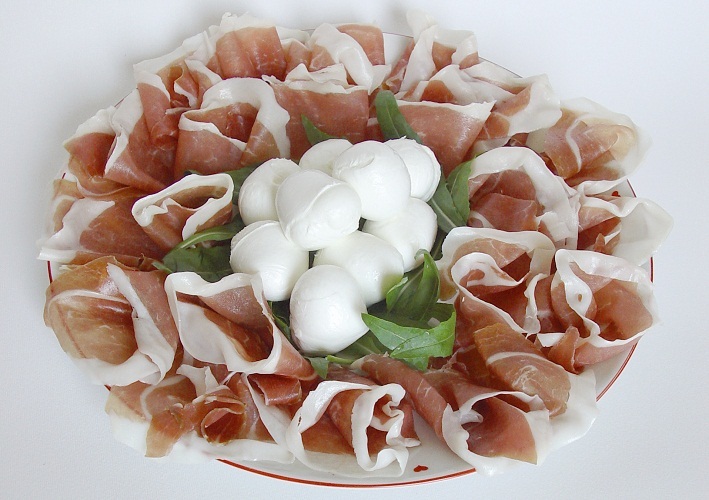 Prosciutto di Parma is aged 18-36 months, creating a range of flavors and textures. The production of genuine Parma Ham is the story of a special relationship between man and nature. Since Roman times, the unique conditions of the Parma region have made it possible to produce the highest quality hams that have been appreciated by gourmets for centuries. ‘Prosciutto’ is from the Latin ‘perexsuctum’ meaning ‘dried’ – an indication of the purity of Parma Ham production and its ancient roots. It was in 100 BC that Cato the “Censor” first mentioned the extraordinary flavour of the air cured ham made around the town of Parma in Italy; the legs were left to dry, greased with a little oil and could age without spoiling. A tasty meat was obtained which could be eaten over a period of time while maintaining its pleasant flavour. Even earlier, in 5BC, in the Etruscan Po river valley, salted preserved pork legs were traded with the rest of Italy and with Greece. The similarity between present-day Parma Ham and its “ancestor” is evident and nowadays the tradition of Prosciutto di Parma is as strong as ever.